New York Fashion Week was amazingly inspiring to me. I love taking photos of street style in general. And when it’s fashion week, you get the what my husband Mark calls the “World Series” of style. The sidewalks full of pros and people in-the-know when it comes to current and upcoming trends. Far be it for me to endorse any kind of follow-the-leader or herd mentality. I mean, we should each decide what colors, textures, and cuts reflect our personal style. At the same time, I believe style can be a sort of street dialogue. Ideas can bounce around, become transformed, evolve, and turn into something that reflects our culture and times. I’m thinking that that might be an explanation for some of fall’s current hottest colors: pink and yellow. I mean, they’re trending but aren’t really all that hot. In fact, several shades are quite cool, which makes them seem more like spring colors. But, if the fashion world is in an upheaval – with creative directors leaving brands like crazy and the new see-now-buy-now model – why shouldn’t street style be turned on its head too? 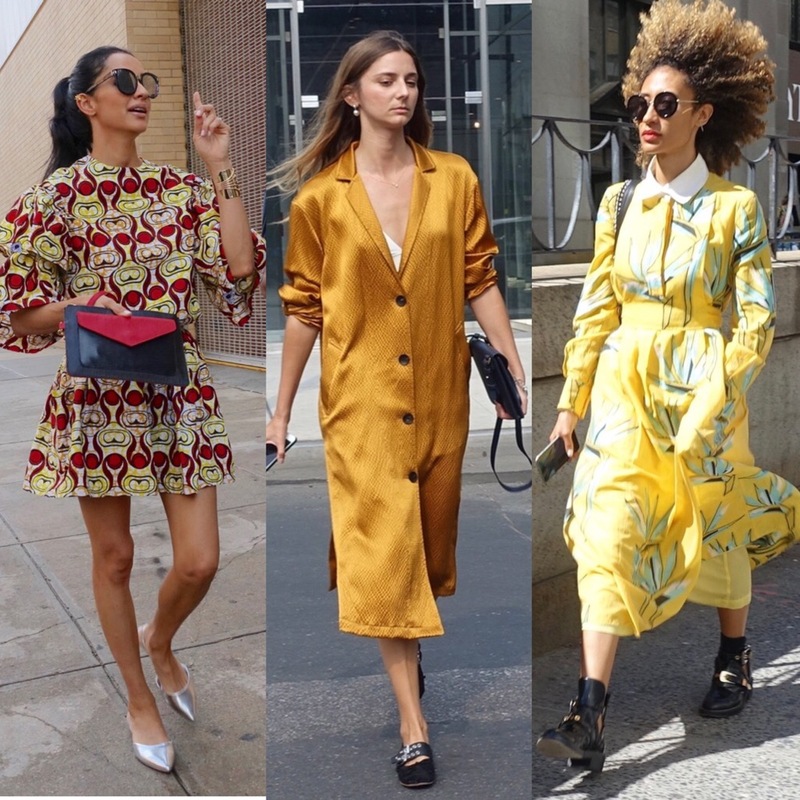 I have to admit that when these photos were taken, temperatures were around 90°F (32°C), but I think you can tell that fashion show-goers made a sincere attempt to dress for fall. I even saw women in furs! As you can see, pinks were out in all of its shades from millennial pink to fuchsia. 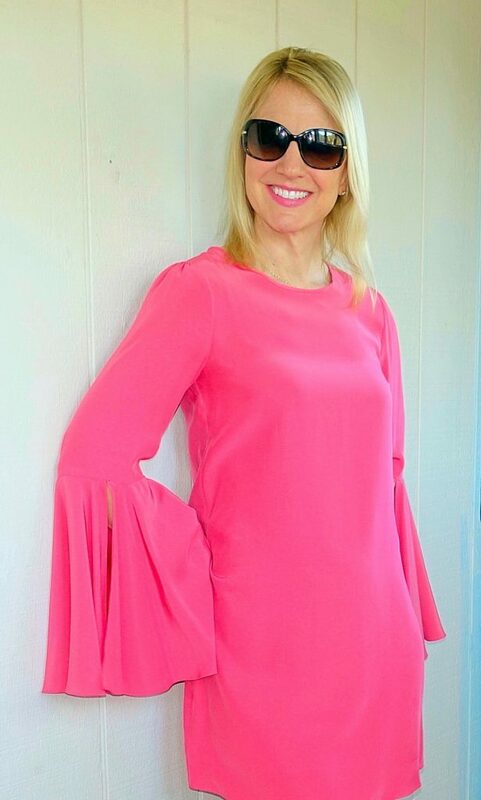 There’s a shade out there to suit just about anyone’s coloring, but of course, there’s also the recourse of wearing a more flattering color – layering makes it so easy! – between that pink and your face. If you assume that you’re not the kind to wear pink, I highly recommend trying shades that you hadn’t previously considered. I was recently surprised by finding out that this pink suits me. The same general rule goes for yellow. I have to admit that I don’t find any shade of yellow to be flattering to my complexion. There are blondes who look great in it, like Liliya or the woman pictured below, for example. In my case, however, not one shade suits me, whether it’s mustard, lemon, or pale yellow. If I wanted to wear it, I would definitely rely on some of the tricks illustrated below. The following muses wore one of this season’s hottest combinations: pink and yellow. In the first, you can see how well fuchsia serves as a buffer when it comes to color and is super on-point with these pink and yellow pants. Here’s another great way to wear yellow. That is, when it doesn’t quite favor your skin tone: a chunky Iris Apfel-sized necklace (another buffer) in a more flattering hue. 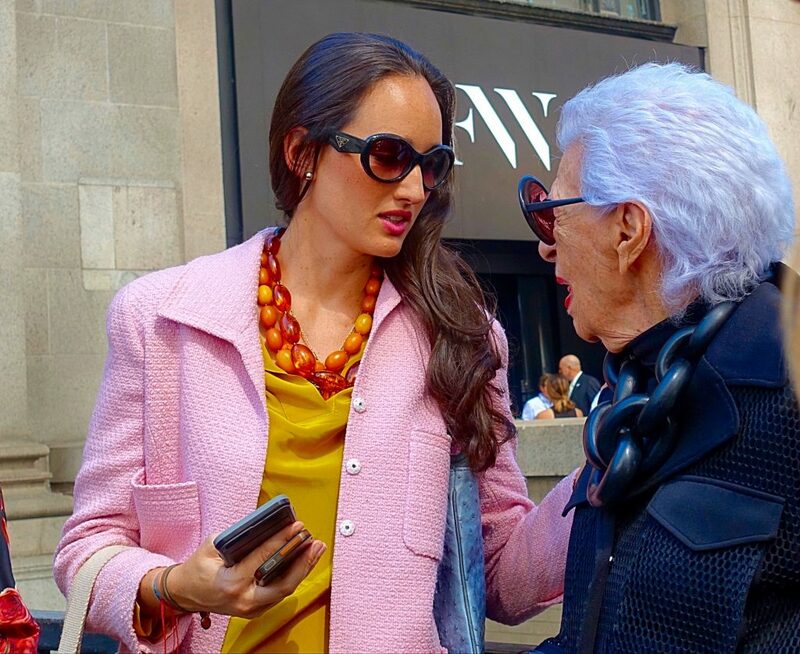 This woman who accompanied Iris to the Naeem Khan show demonstrates. Yes, mustard is traditionally a fall color, but with pink…! Or, there is also a last no-fail solution: wearing yellow in one’s shoes or bag. Going back to my pink dress, I can see color-blocking with that, a yellow bag, and black sandals. It totally works with the pink dress and yellow handbag pictured below. This dress is by Ukranian designer, Yulia Magdych, combining both traditional and modern themes. Gorgeous! 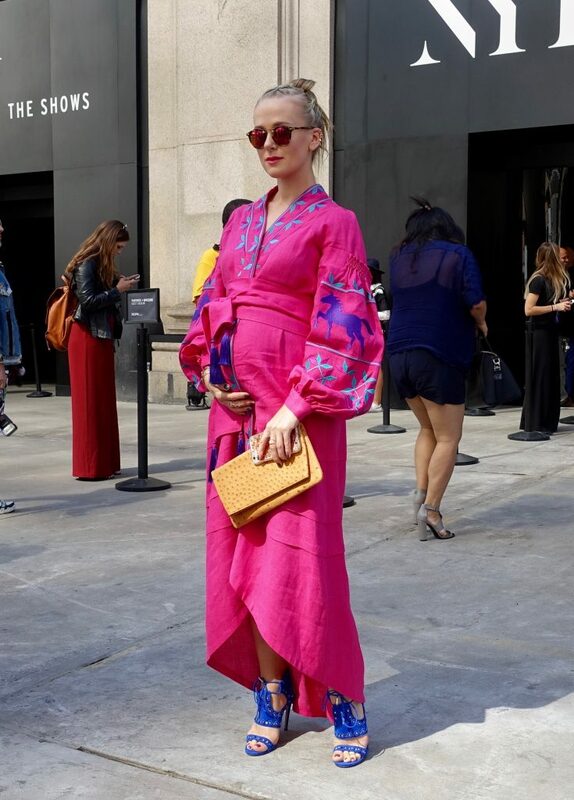 I have to admit that I avoided pink and yellow like the plague until just recently, but thanks to fashion week street style, I’ve seen the light. And speaking of light, I find these colors much cheerier than traditional fall dressing. Are you up for pink, yellow, or pink-and-yellow this fall? What stylish looks! Mustard is a gorgeous color!! I see more diversity than a trend, but that is amazing, Janea! I love pink and yellow, it’s one of my favorite, unexpected color combos! Thanks for sharing, beauty, and have a wonderful day! This color combo can be so fun! These are a lot of cool looks! Wow! This is fashion! You have a point with those photos! And trying shades is the best tip ever!